Bathroom remodel in Bryan / College Station, by Stearns Design Build. We took advantage of the space that was available, and opened it up. Incorporating characteristics into your bathroom that allow for ease of access, no matter your range of mobility, adds longevity and adaptability to your space. This is especially important if you’re approaching the elder years of your life. And even if that isn’t the case, you might still want to make your bathroom accessible in case of a sprained ankle or other unforeseen injury. Whatever your reasons for considering adding ease of access to your bathroom, here are some suggestions to get you started! Start with the actual space of the bathroom. The bathroom should be large enough or at least have a large enough area for maneuverability. This should be a space with a clear five foot radius. The entry into your bathroom is crucial as well. The door should be at least 32 inches wide and should swing outward so that if you slip when inside and can’t get up, someone can get in and help you. If you don’t have space for this kind of swing, a pocket door is also an option! Materials for flooring should be slip resistant and impact resistant. Don’t forget to look at sustainable options with recycled content. Sink faucets should also be easy to operate with either lever handles or a single handle, so that someone with only one available hand or not a lot of strength can use them. Handheld sprayers are good to incorporate in the shower or bathtub areas and should be mounted so that someone at seated or standing height can reach them. 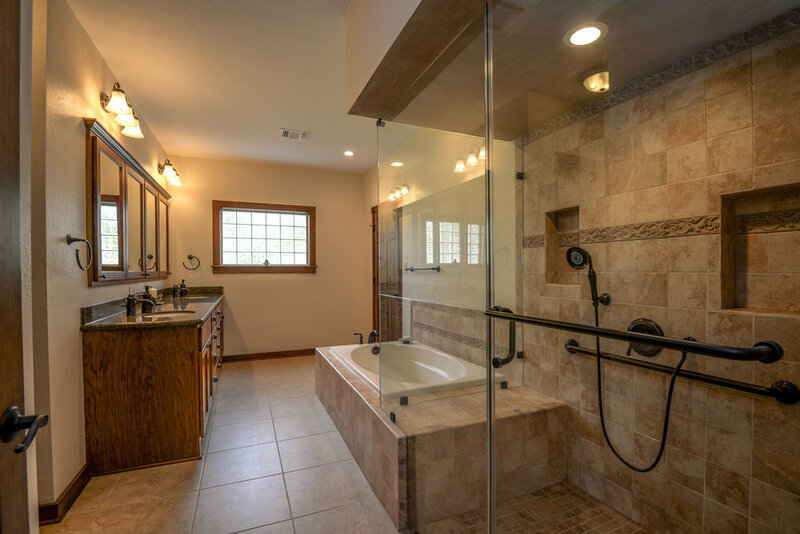 We hope these thoughts are helpful to you and your plans for an accessible bathroom! Be sure to check out our Part 2.